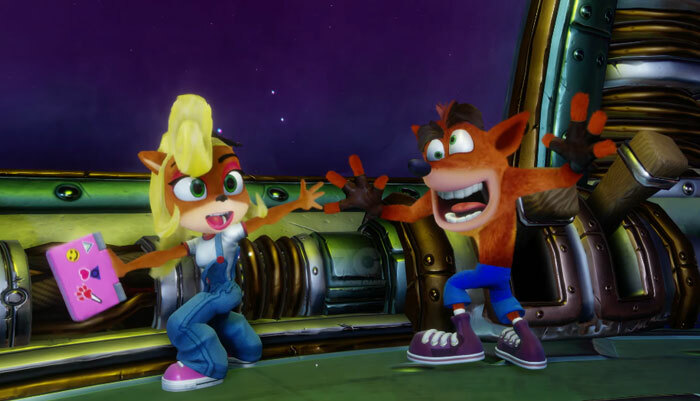 Crash Bandicoot won't be the only playable character in N. Sane Trilogy, as his sister joins in on the action and lends her crazy brother a helping hand against Dr Neo Cortex and his evil henchmen. Vicarious Visions are giving fans of Crash's little sister a special gift. 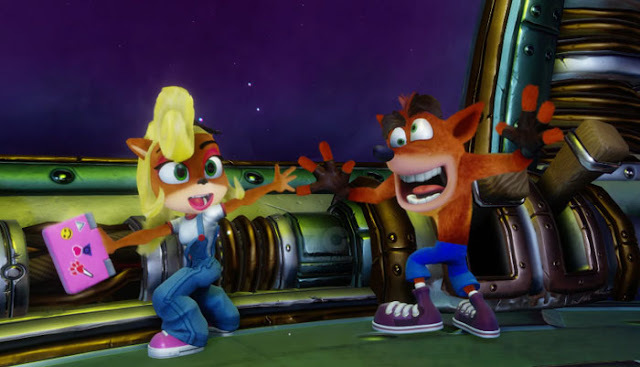 For those unacquainted with the Crash universe, Coco Bandicoot is Crash's gleaming, tech-savvy sibling, who first appeared in Crash Bandicoot 2: Cortex Strikes Back as a supporting character. During Sony's E3 2017 press conference pre-show, we got a first look at Crash Bandicoot N. Sane Trilogy's launch trailer, which shows Coco Bandicoot as a playable character. While Crash's younger sister was temporary playable in Crash Bandicoot 3: Warped through special levels, she was never a fully playable character until now. It was an unexpected yet pleasant surprise, but making Coco Bandicoot a playable character outside of the special levels was one of the best things Vicarious Visons could've done for the remake. For one, it's refreshing to play as someone other than Crash Bandicoot. While the lovable goof can't be replaced, it's a nice change to play as Crash's little sister, something that wasn't possible originally. Overall choosing Crash or Coco is simply a matter of preference. Coco's gameplay style isn't much different from her brother, in fact they're pretty much the same although there's a difference in animation. Coco has a double leg drop, hurricane spin and Fruit Bazooka at her arsenal. In reality Coco is pretty much a re-skin of Crash. Coco looks absolutely adorable in N.Sane Trilogy, whether she's taking a selfie, collecting Wumpa fruits, riding Pura or simply dancing. Comparing Coco's original look and her later activision designs to Vicarious Visons remake unveils an impressive evolution of the character. Coco Bandicoot looks fantastic and we can't wait to control her. Though by now you're probably wondering how Coco is going to be implemented into Crash Bandicoot 1, seeing as how she made her debut in Crash Bandicoot 2. Well it's simple, Coco has gone back in time to help her brother Crash in his previous adventures. A short yet simple explanation as to the reason Coco is playable in Crash Bandicoot 1. Crash Bandicoot N. Sane Trilogy releases 30th june 2017 on PlayStation 4. Unfortunately you can't play as Coco Bandicoot right off the bat, you have to earn the right to. It's also worth noting that Coco can't participate in boss battles and neither can she be used in her brother's special themed levels like Hog Wild as an example. Got all that? With that said, here’s how to unlock Crash's sister in each of the trilogy’s titles. After defeating Papu Papu, Coco’s time machine is a "stage" directly below Papu’s shack. You can use the new level to toggle the blonde bandicoot on and off. When Coco’s toggled on, you can press R2 to swap between Crash and his sister. You’ll have to complete five worlds in the Warp Zone, then defeat Ripper Roo. After succeeding, journey up to the next set of worlds, and you’ll see Coco’s time machine close. This is used to toggle Coco on and off. This one’s the quickest — Coco’s is unlocked right from the beginning. Though you’ll still need to talk with her in the main platform before you can turn the toggle off and on. You don’t have to do this to play the stages that were primitively Coco’s, of course. Just awesome! 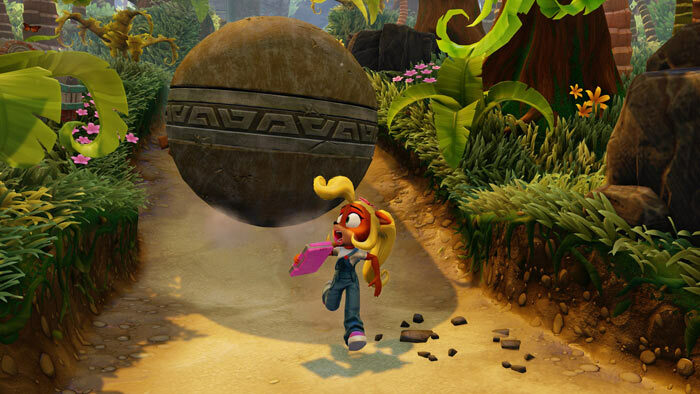 Coco is fully officially confirmed to be playable the whole way through, I love her animations and she's brimming with much more personality here than in the old games :). Can't complain about anything in this. I know Naughty Dog are working on Uncharted 4 and The Last of us 2 but they must regret selling the rights of Crash Bandicoot now. Just look at it. I can't to play this game, i finished Yooka-Laylee and this is the perfect experience to scratch my platforming itch. After this it's onto Sonic Mania. I never thought i'd see the day that Crash Bandicoot would be back. That game's pretty old but at least it's a remake and not a remaster. Cool, I can't wait to play as Coco bandicoot.